Three natural essential oil soaps: Sweet Lemongrass, Lavender Cream Goat Milk and Peppermint & Thyme (Mountain Morning Wake Up Call). This Soap Trio Gift iincludes three full size soap bars individually wrapped in colorful, coordinating paper cigar bands over corrugating cardboard and stacked inside a clear, cellophane bag, tied with matching color raffia. 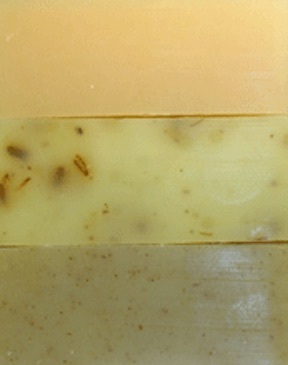 A gold foil product label identities the soaps inside the Trio. Olive, Coconut, Palm and Castor Oils, Shea Butter, Cocoa Butter, Sodium Hydroxide (Lye), Mountain Spring Water, goat milk, Lavender Essential Oil.